ioby is proud to announce $50,000 in matching funds for projects in Memphis. 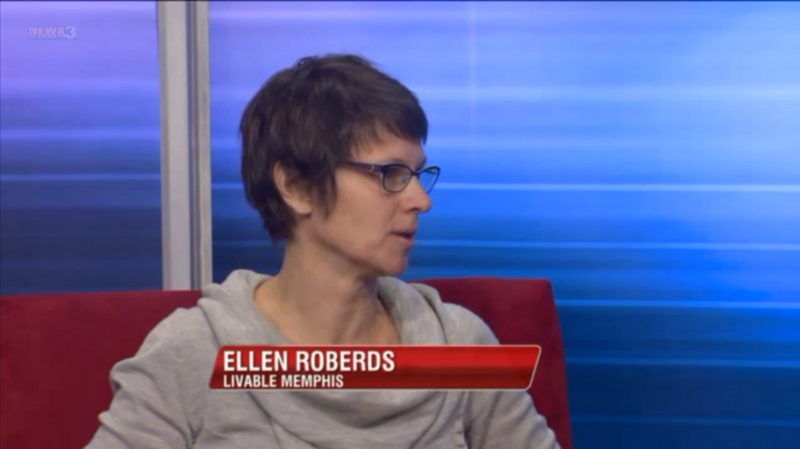 Watch Ellen Roberds from Livable Memphis on WREG Live at 9 explain the opportunity here. Betsy Robinson never saw herself as a community organizer or leader. 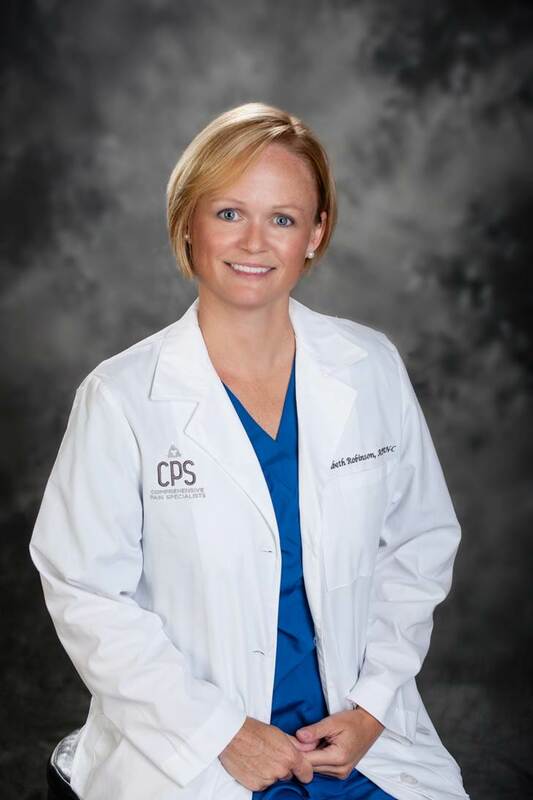 A nurse practitioner originally from New York, she’d landed with her family in Midtown Memphis via Denver, and – like most Americans – she just hadn’t been exposed to the I can be the one who makes it happen mindset. Yet here she is today, one successful ioby campaign just behind her, a second already barreling down the pipeline. The first, which you can go visit now, is a vibrant community mural painted onto the Cooper/Higbee Underpass in Midtown – a joyous spread of ginkgo leaves, dandelion leaves and fluff, homes, bikes and bike lanes, images of kids jumping, hands shaking, fists bumping, and a map of Midtown. 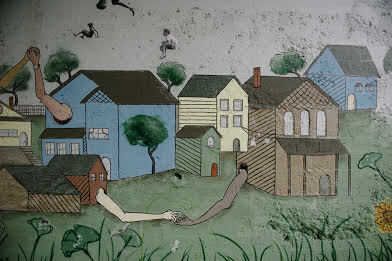 The second mural, which is almost fully funded (click here if you’d like to donate), will go up right around the corner, at the Central Ave underpass. And so, in a few short months, Robinson has become one of Midtown Memphis’ dedicated community leaders, a fact which still seems to surprise and delight her. “I honestly never thought I would do anything like this, ever,” she insists. So what happened? The short version: A little help – and a little push – from her friend. 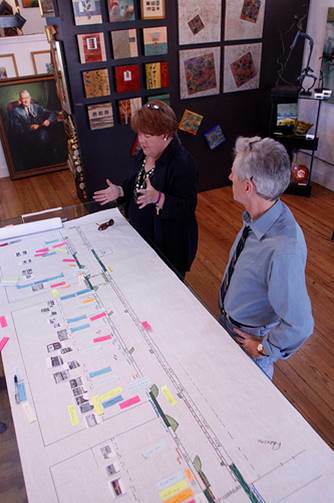 When Robinson and her family followed her husband’s job to Memphis seven years ago, they chose to make their home in Midtown – just 100 yards from the twin mural sites – in large part because there was a park right nearby. They loved the walkability of the neighborhood, but the truth was that the park had seen better days, and the walk to and from was rundown, too. 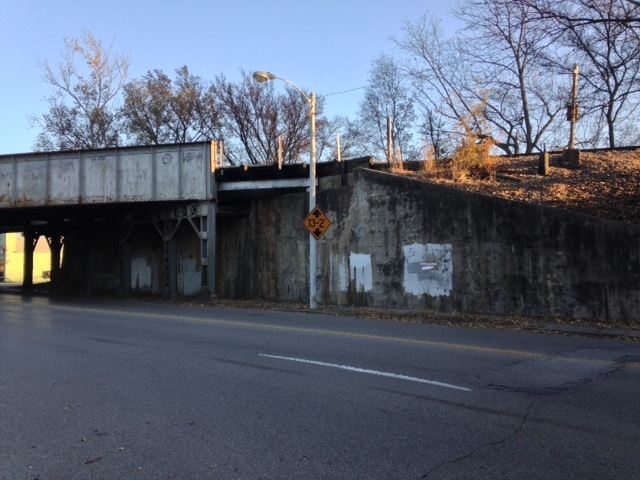 Robinson was particularly desperate to see someone brighten up the dismal – and very highly trafficked – underpasses that lay between her family and the park. Somebody should… somebody should. Sound familiar? Meanwhile, Robinson’s friend, Ellen Roberds, had taken a job with Livable Memphis, and begun to talk about her new work as a placemaker and community builder. One day, Robinson mentioned her idea to Roberds; why didn’t someone brighten up the dismal twin underpasses at Central Ave with some murals? Why didn’t someone give them a little TLC? 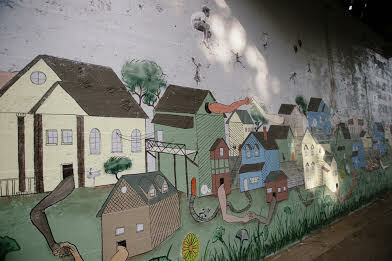 But Robinson’s curiosity was piqued, and when Roberds took her to see a community mural in another part of town, explained what their budget had been, and told her about ioby, the project started to look tantalizingly doable. 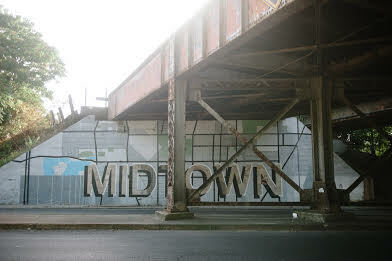 Robinson reached out to the folks at the Urban Arts Commission for advice, hooked up with some local street artists and painters over at the Memphis College of Arts, and before she knew it, she was in too deep to turn back – she couldn’t deny that she herself was exactly the right person to spearhead the project. Because it mattered to her. Because it was, almost literally, her backyard. “So I did it,” Robinson says. “I actually went home and made the ioby account that night, and it was live the next day.” Within two days, she’d raised the $1,500 she needed to make the first mural a reality. One of the most inspiring aspects of this second mural project is that, this time around, Robinson is determined to pay the artists for their work: $1,000 each. “They were flabbergasted,” Robinson said. The first mural had put them in the limelight and brought other commissioned projects in for them, but they’d never expected to be paid for either mural. And when local artists are being paid for community work, you know something good is afoot. It’s a lasting tribute to Robinson’s brother, who died last December. She also learned that she had many more community-oriented skills in her than she’d ever known. 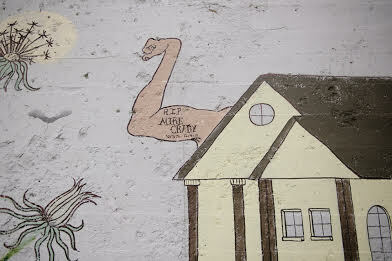 The two mural projects have drawn them out of her, to her surprise. “There’s a lot of things I didn’t know I was capable of, in doing this,” she says. The Hampline is one of ioby’s favorite campaigns for a lot of reasons. It’s not only because the Hampline was ioby’s first campaign in Memphis, ioby’s first campaign to raise funds for hard infrastructure, and ioby’s highest grossing campaign to date. The project is to us a brilliant collaboration, blending commercial revitalization, placemaking, cycling infrastructure and the arts in a community suffering from disinvestment. It’s an important and rich story, and we’re proud to play a role in the success of the project. Like many U.S. cities, Memphis, Tennessee has suffered from residents moving out from the urban core to the suburbs. Between 1970 and 2010, the city population grew by 4% while the geographic area grew by 55%. The city limits doubled in size, but population remained flat, and residents packed up and moved to the outer edges of the city. Dispersion created lower density, leaving the core looking like Swiss cheese, with more than 50,000 vacant lots in the city. Population shifts were coupled with the construction of I-40. 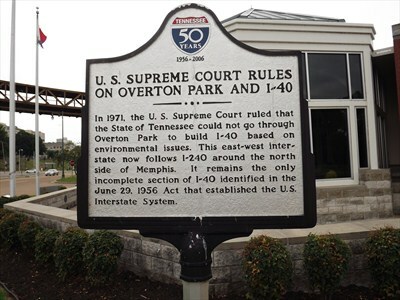 Although Memphis is home to the notorious Supreme Court case Citizens to Preserve Overton Park v. Volpe (1971) that stopped the construction of 1-40 through an established neighborhood and central park, not all neighborhoods fared so well. Similar to the way that the Cross Bronx Expressway cut off the South Bronx from the rest of NYC and compounded socio-economic barriers with a lack of physical geographic access, I-40 cut right through Binghampton, putting five lanes of high-speed traffic between the residential area and the established commercial district on Broad Avenue. Binghampton, lovingly nicknamed “The Hamp,” is today a neighborhood of about two square miles and 9,000 residents. The median income is $26,000, and nearly 50% of residents have average household incomes below $20,000. Of the residents, 35% live below the poverty level. In recent years, the neighborhood has suffered from 30% population decline, with a 10-14% vacancy for homes in the area. It’s not surprising that this is the case. It’s not easy to live in the Hamp. There are two active rail lines and an expressway with dangerous cross traffic. Vacant properties have led to an increase in blight. But the neighborhood is literally surrounded by assets. To the west are the famous Overton Park, Rhodes College, the Vollintine-Evergreen Greenline, Downtown Memphis and its historic Beale Street, and the beautiful Mississippi River. To the east are Shelby Farms Park, the Greenline Extension, the Wolf River Greenway, and thriving neighborhoods. 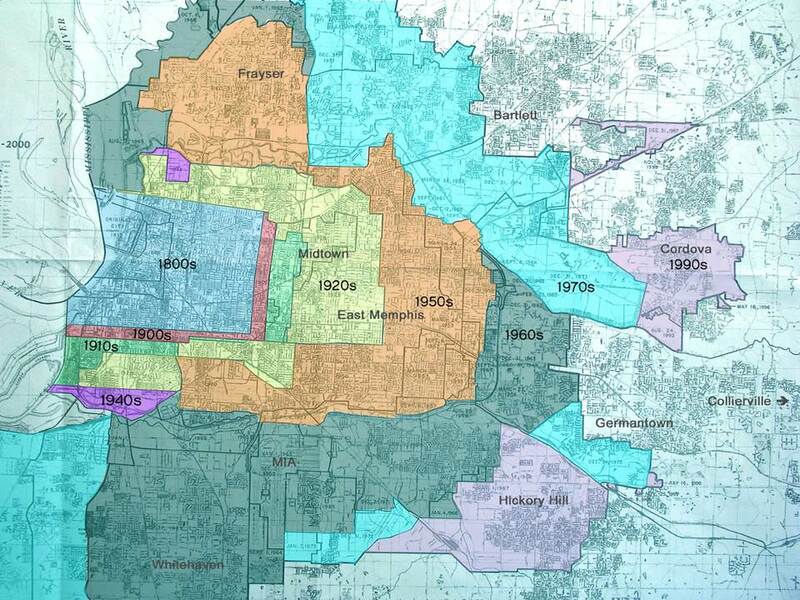 The opportunity was that connecting these assets, through Binghampton, and several other neighborhoods, would strengthen Memphis’ urban core. 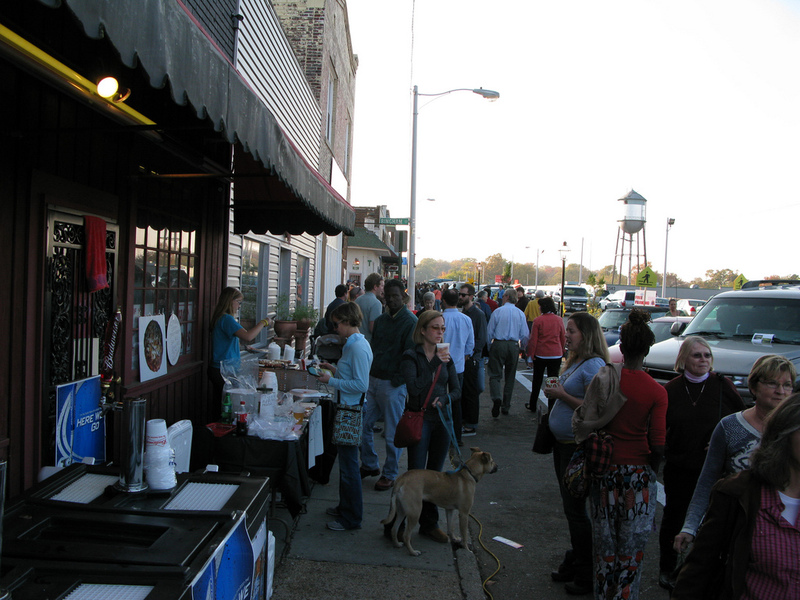 In 2006, the city of Memphis began a charrette process using Broad Avenue as a test case, and the planning galvanized the neighborhood and created a business association. Together, residents and business owners came to believe that Broad Avenue could be a place for economic vitality. In 2008, there was just one lonely mile of bike lane in Memphis, and the paths to the 4,500-acre Shelby Farms Park were unsuitable for biking, giving Memphis the unenviable position of “Worst City for Biking” (as ranked by Bicycling Magazine—along with another ioby priority city, Miami—in 2008 and 2010). Inspired by advocates, Mayor A C Wharton set about changing that, by hiring the city’s first bike-ped coordinator and setting a goal of adding 55 miles of bike facilities within city limits. Soon to follow was the Shelby Farms Greenline, a 6.5 mile bike lane connecting Midtown Memphis, just on the other side of Overton Park, to Shelby Farms. 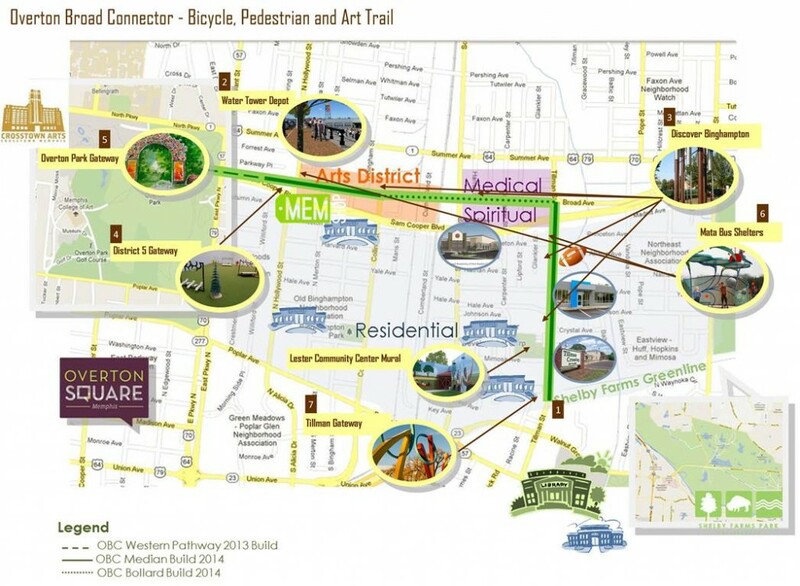 Livable Memphis, a program of the Community Development Council of Greater Memphis, saw an opportunity to connect these two great assets—grounding a major cycling highway while bringing traffic through an emerging business and arts district. As with many neighborhoods of disinvestment and blight, Binghampton had a reputation for crime to overcome. Although Binghampton’s “actual” crime rate was decreasing, nascent revitalization efforts and connecting assets would further reduce Binghampton’s “perceived” crime. 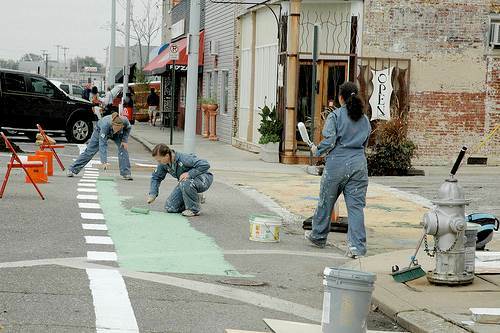 To jumpstart the pre-vitalization process and overcome perceptions, the Livable Memphis, the Broad Avenue Arts District, and the Binghampton Development Corporation, and the owner of an anchor business, T Clifton Arts, drew on a tactical urbanism tool from Dallas, Texas, called Build a Better Block. The Better Block method, developed by Jason Roberts, uses a 24-hour intervention to reimagine small public spaces in commercial corridors, as if the corridor were thriving, as it perhaps was in the past. Pop-up businesses, public arts, and temporary installations allow residents to reimagine the use of public space, without the investment and the time to make permanent capital improvements. For Binghampton, the Better Block method was translated for the locality, and A New Face for An Old Broad was born. For a single weekend, the desolate Broad Avenue was transformed into a thriving commercial district, with protected bike lanes and cultural programming. 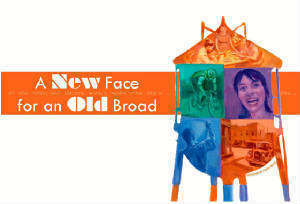 Watch the videos about New Face for an Old Broad here. And this was just the beginning. What followed over the next year was $2.5 million in private investment, and in the next 3 years, more than $18 million. By the fourth year, the commercial district had 95% occupancy. As investments in local business boomed, cycling advocates began fundraising for the infrastructure to build the two-mile connection between Overton Park and the Shelby Farms Greenline, at that time called the Overton-Broad connector. The $4.5 million bike lane would be the first of its kind in the United States. A two-way, protected, signalized cycle track would run straight through the emerging commercial district. Neighborhood and cycling advocates, businesses and the City raised federal, state, city and private funds, but in August of 2013, was faced with a $70,000 gap. They could wait for the next city council cycle to request the remaining funds and delay the project, or compromise the safe and innovative design for the route. Or, they could raise the funds themselves from their friends, neighbors, and folks who would like to use the route. The groups leading the charge – the Broad Avenue Arts District, Livable Memphis and T. Clifton Arts – and their leaders – Pat Brown, Sarah Newstok and Sara Studdard — approached ioby with their challenge to raise $70,000 by Thanksgiving. Raising the remaining funds would mean groundbreaking would begin in April and the construction would be completed in phases through Spring 2015. The leaders agreed that their catchy fundraising campaign needed a title that would be easy to remember and authentic to the Hamp neighborhood’s unique character. After some deliberation, the Hampline was born. The Hampline team started their campaign by asking their closest networks – friends, family, and colleagues – to donate $50 each. At the same time, a local bicycle club called the Memphis Hightailers came to the table with $2,500 in matching funds for donations made by their members. The team prudently decided to cap the amount of match funds applied to each donation at $50, so that donors with large contributions would not drain the pot too quickly. Using this match fund as an incentive, the team raised $2,530 in citizen philanthropy within the first four days of launching. By the end of the first week of the campaign, the team had raised close to $8,000 and the press was starting to pick up on this exciting new effort. They repeated this successful strategy with the Evergreen Neighborhood Association. Recognizing that a $70,000 goal seemed daunting and unattainable for many donors who were only capable of making small contributions, Pat, Sarah, and Sara wisely began to make asks in bite-sized chunks. Rather than focus on the lofty total that they needed to raise, they began to ask many of their donors for $55, which they calculated to be enough to sponsor exactly one foot of the Hampline. 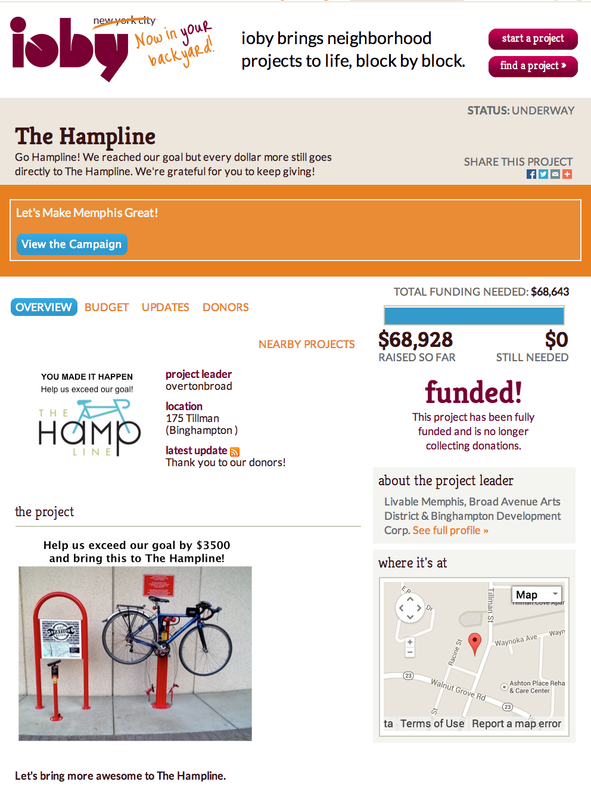 About two weeks into the campaign, with about half of the money raised, the Hampline’s tremendous progress started to plateau. The team worked with ioby’s team of strategists to reorient and reenergize their campaign. They assigned fundraising roles and responsibilities to the campaign’s most ardent supporters, added some new prospects to their list, and identified new opportunities to make in-person asks. Working in tandem, the team made a series of phone calls, sent out emails, and appeared at community gatherings to share their work, make asks, and recruit new supporters. The Hampline also benefited from two additional matches over the course of the campaign, thanks to generous support from Alta Planning and Design and the Hyde Family Foundations. Ultimately, the combination of matching funds and the team’s direct and explicit style of making asks were enough to get the team across the finish line on time. The result was that more than 700 people, living with just a couple miles of the future bike lane gave to the campaign, the median donation was $50, but many people giving just $9.01 (the city’s area code). Not only did the local giving demonstrate a groundswell of community support, but it also fostered a culture of ownership and local stewardship of the space. Donating to the Hampline became the cause célèbre of the city. Groundbreaking took place as planned in April, and the archway went up. Today, Broad Avenue has more than 95% occupancy. 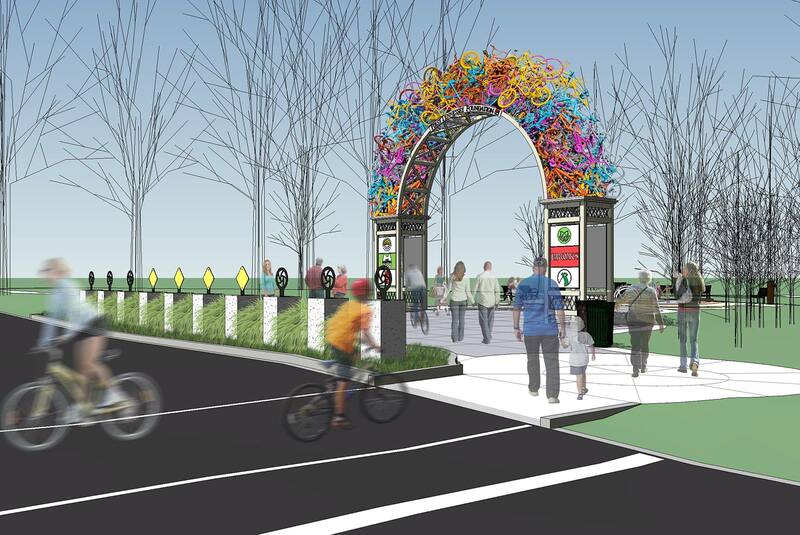 Additional private funding has supported cultural amenities in the area, creative bus stops and an archway made of bicycles at the entrance of Overton Park. 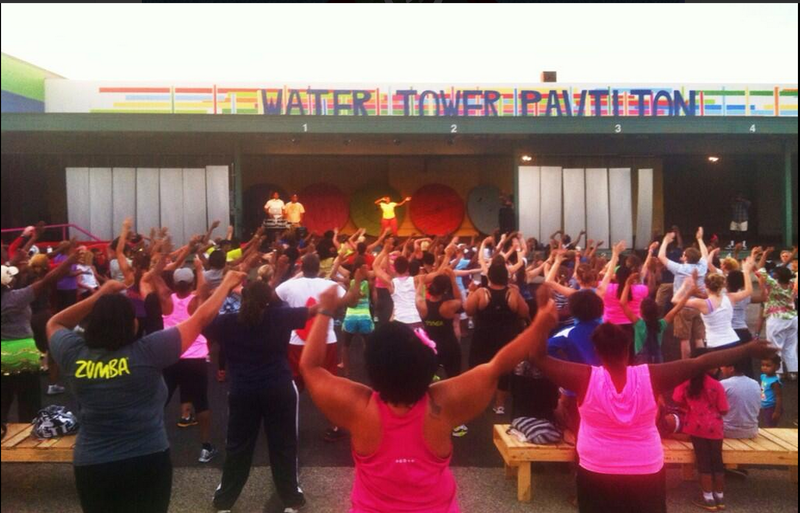 The ArtPlace America grant has enlivened the avenue to zumba, dancing and performance arts on weekends. All of this transforming the neighborhood nearly unrecognizable to its former self just five years ago. You can download the two guides separately, or together as one PDF. Your choice. Starting Small. How to Get Permission to Get Good Done in Memphis. Etiquette Guide to Doing-It-Ourselves (DIO) Neighborhood Improvements in Memphis. 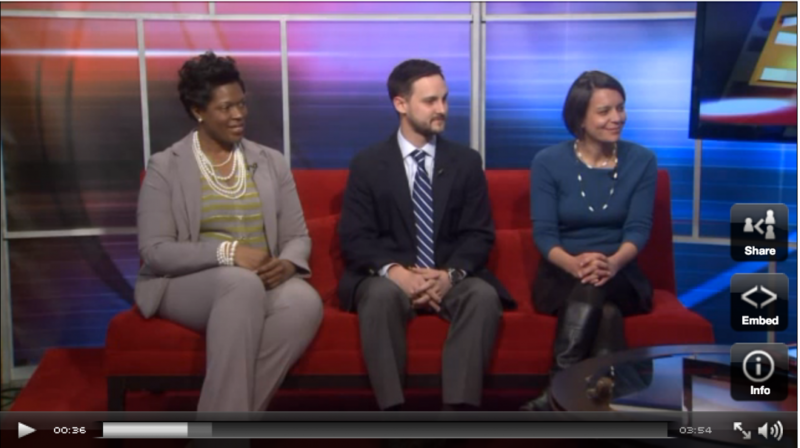 This morning ioby leaders Kirk Williamson from Memphis Civic Solar and Principal Reneta Sanders from the Carnes Elementary School Learning Garden shared their visions for Memphis on Live at 9 with Alex Coleman and Marybeth Conley. Watch the video clip from Live at 9 here. One you hear their inspiring projects, we know you’ll want to support their work now. To give to their projects and any other projects in Memphis, visit ioby.org/Memphis. 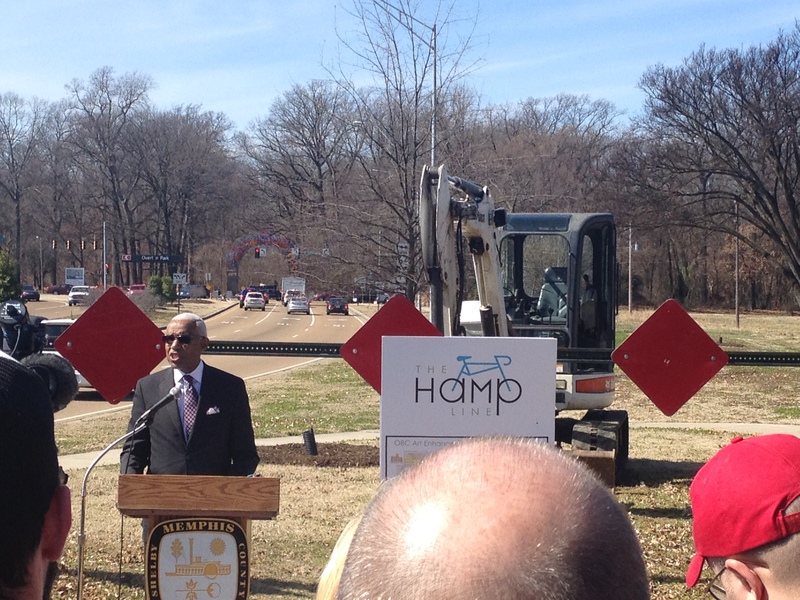 We could not have been more excited to see the groundbreaking ceremony for the Hampline in Memphis last week. Congratulations to Livable Memphis, the Broad Avenue Arts District, the Binghampton CDC, to Mayor AC Wharton and all the residents of Memphis. Today is a great day! MEMPHIS, TN – ioby.org/Memphis officially launches today to support citizen-led neighbor-funded projects to make Memphis neighborhoods stronger and more sustainable. Run by the nonprofit organization ioby (pronounced eye-OH-be), the digital platform allows anyone to share their idea for their own community and raise tax-deductible donations and recruit local volunteers. So far, the ioby platform has been used by community groups in 96 cities across the U.S., fully funding more nearly 300 projects with citizen philanthropy. Since ioby was founded, the organization has supported the activation of more than 65 vacant lots. More than 70 ioby leaders have created a new system of food production and distribution. In the last three years, ioby projects have cleaned, cleared, protected, opened, activated and stewarded more than 14,000 acres. People of color lead most projects on ioby, and women and girls make up more than 70% of all ioby leaders. ioby.org/Memphis launches today with new ideas to eliminate blight, to increase access to healthy foods and to prototype new tech tools for education and enjoying Memphis’s extraordinary greenways. One project – Memphis Civic Solar – aims to install solar panels on thirty municipal buildings, one of the largest municipal solar projects in the nation. Most ioby projects focus on food, transit, public health, public art, the environment, schools, citizen science, tactical urbanism, placemaking, local sharing economies and work wherever neighbors are working together for change. ioby.org/Memphis launches today with 11 new projects for South Memphis, Klondike / Smokey City, Vollintine Evergreen, the Carnes School Neighborhood, Frayser, The Heights, Whitehaven and Downtown. 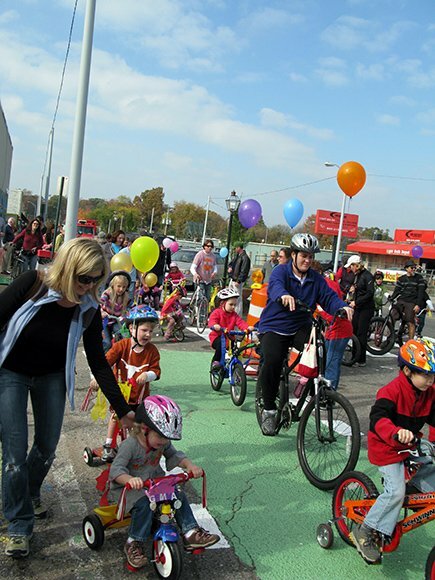 Before ioby’s official launch in Memphis, the platform supported the fundraising campaign of the Hampline, the innovative two-way, signalized protected bike lane along Broad Avenue that raised $78,000 from more than 600 Memphians that live near or in the Binghamton neighborhood. Memphians interested in starting a project in their neighborhood can do so by following links on ioby.org/Memphis, and are encouraged to attend the ioby Recipes for Change Conference: Crowd-Resourcing For / By Memphis the week of February 24 in Memphis. Details about the conference can be found on ioby.org/Memphis. A list of all new projects on ioby.org/Memphis and short descriptions follow. In October 2013, Livable Memphis came to ioby, turning to their neighbors to raise the remaining five percent of their $4.5 million budget for the Hampline. Raising over $75,000 using ioby’s crowd-resourcing platform, the team at Livable Memphis—led by Sara Newstok—oversaw the first successful crowd-funding campaign for civic infrastructure in history. Designed to be a safe active transit route, the Hampline is a two-mile, on-road/multi-use trail designed for all levels of experience in walking and biking. It will showcase best practices with regards to protected cycle tracks: green lanes. By linking the western terminus of the Shelby Farms Greenline with the existing trail network within Overton Park, the Hampline is the essential link for the growing on-road and multi-use system in east Memphis and beyond with the on-road bicycle network west of Overton Park toward the River. NYC has a few similar cycle tracks, as does Montreal and Vancouver, B.C. But nothing surpasses the build that is schedule to take place linking Overton Park with Broad Avenue and the Greenline. Memphis has positioned itself as an example of best practices and innovation for bike lanes in the United States. The City of Memphis is one of six cities to participate in Bikes Belong’s Green Lane Project specifically due to this innovative project. The Hampline features two miles of public art murals and sculptures, an amphitheater and numerous art galleries, this bicycle and walking track is located in the Binghampton Community (“The Hamp”) and links Overton Park and the Shelby Farms Greenline via a state of the art, two-way protected cycle track. In addition to adding vital connectivity to the growing bicycle network across the Memphis region, the Hampline will provide residents and visitors with safe access to facilities and amenities in the Binghampton neighborhood including the five neighborhood schools, Tillman MPD Precinct Station, Howze Park, Lester Community Center, Benjamin Hooks Public Library, spiritual and medical facilities, the Arts District, and the amenities located within Overton Park. Mary Phillipps and her team at the Roots Memphis Farm Academy are growing the local food economy in Memphis from the ground up. Recognizing a strong and growing demand for locally grown food in their city, Roots Memphis Farm Academy is incubating local producers of sustainably grown food and connecting them to markets. In July 2013, the Roots Memphis Farm Academy launched a post-secondary alternative education tract, consisting of 15 weeks of business management classes, and 15 weeks of sustainable farming classes. After students have successfully completed their academic course work, they lease land from Roots Memphis, during which time they receive ongoing assistance, including tool share, labor share, and other technical assistance and consultation. This incubation period is designed to allow students to develop necessary hands-on skills in a low-risk environment. The first incubation period will begin in March 2014. The Roots Memphis team is also working with local lenders and investors to develop a partnership through which the Farm Academy will produce qualified applicants for financing. They are also partnering with local government to provide graduates with parcels of land for low-cost purchase upon graduation. Roots Memphis looks to make small farming ventures successful profitable in order to increase farmers’ access to capital. Developing a robust economy for small farms is particularly important in Memphis, where unemployment is at a staggering 10%. The unemployment rate is even higher for minorities and those without a college degree. Small farm ownership has an important legacy in the region tied to economic self-determination, boasting original champions such as famed civil rights activist Fannie Lou Hamer. Given the city’s harsh economic climate, the Roots Memphis Farm Academy looks to transition local food producers in Memphis from non-profit or community-based models to models that can provide sustainable incomes for farmers and economic resilience for regions. Memphis Bioworks is launching Memphis Civic Solar, a project for the City of Memphis that will install 1.5 Megawatts of solar energy spread across 30 different municipal buildings (50 kilowatts each) in neighborhoods throughout Memphis. When completed, Civic Solar will be one of the largest municipal solar projects in the nation, positioning Memphis as a national leader in sustainability and creating positive and measurable environmental, economic and social benefits for the citizens of Memphis. Kirk Williamson and his fundraising team at Memphis Bioworks are using ioby’s crowd-resourcing platform to raise $49,900, or a little more than 1% of the overall budget, as seed capital to launch the project. The seed money will ensure that the project meets engineering, design and utility deadlines and brings solar energy to Memphis in way that is impactful and inspiring. While the launch is set for the spring of 2014, utility agreements must be allocated prior to launching Civic Solar, which could mean that the project launches at a later date. After the initial seed capital is raised, the overall project will become self-funding and sustainable and will not utilize any taxpayer money. Memphis Bioworks, a non-profit organization dedicated to developing Memphis’s bioscience sector, has determined that Memphis’s abundant solar resource is on par with parts of Florida and Texas. With the most sunny days in Tennessee (approximately 214), Memphis is a perfect place to produce solar energy. A large-scale municipal solar project in Memphis will create positive and measurable environmental, economic and social benefits. These benefits include employing 45-50 Memphians, generating enough clean energy to power approximately 200 homes each year, and providing educational opportunities in the community centers and libraries on which solar panels are installed. Many kids in South Memphis are unaware of their neighborhood’s rich history as a music capital and an important site in the struggle for civil rights. Amy Moritz and her team at the Center for Transforming Communities aim to help the neighborhood’s younger generation to reclaim and carry on South Memphis’ positive legacy on the national landscape. By allowing them to build on the memories, experience and wisdom of their elders, the Neighborhood History Project will ensure that the kids leave their own, very important legacy on their neighborhood and beyond. The South Memphis Shalom Zone, an offshoot of the Center for Transforming Communities, is teaming up with Crossroads to Freedom at Rhodes College to train youth archivists from South Memphis to interview the elders in their neighborhood. Over an eight-week summer program, college interns with the Crossroads project will mentor high school students. While on the Rhodes campus, youth will learn interviewing techniques that will allow them to discover positive memories and valuable wisdom from their neighborhood elders. The youth will get hands on experience with video, audio, lighting, editing and other technology skills needed to capture oral histories in South Memphis and store the interviews in the crossroadstofreedom.org archive. At the end of the summer, the youth will present the highlights of the oral histories and what they have learned back to the community. This project was piloted successfully during the summer of 2013, with about 100 community members in attendance for the kids’ end-of-summer presentation. For 2014, the Neighborhood History Project of the South Memphis Shalom Zone will be inviting the youth to come back from summer 2013 and serve as additional mentors and role models to the 2014 youth. In addition, the returning youth will have a second day each week at Rhodes to get even more hands on experience with editing and archiving the video interviews. The Corners of Highland Heights Community of Shalom, an offshoot of the Center for Transforming Communities, is teaming up with Crossroads to Freedom at Rhodes College to train youth archivists the ‘Heights’ and Treadwell Middle School to interview the elders in their neighborhood. Over an eight-week summer program, high school students will be mentored by college interns with the Crossroads project. While on the Rhodes campus, youth will learn interviewing techniques that will allow them to discover positive memories and valuable wisdom from their neighborhood elders. The youth will get hands on experience with video, audio, lighting, editing and other technology skills needed to capture oral histories in the Heights and store the interviews in the crossroadstofreedom.org archive. At the end of the summer, the youth will present the highlights of the oral histories and what they have learned back to the community. This project was piloted successfully during the summer of 2013, with every participating child asking to come back again for the summer of 2014. For 2014, the Neighborhood History Project of the Heights and Treadwell will be inviting these youth to come back from summer 2013 and serve as mentors and role models to the 2014 youth. In addition, these returning youth will have a second day each week at Rhodes to get even more hands on experience with editing and archiving the video interviews. 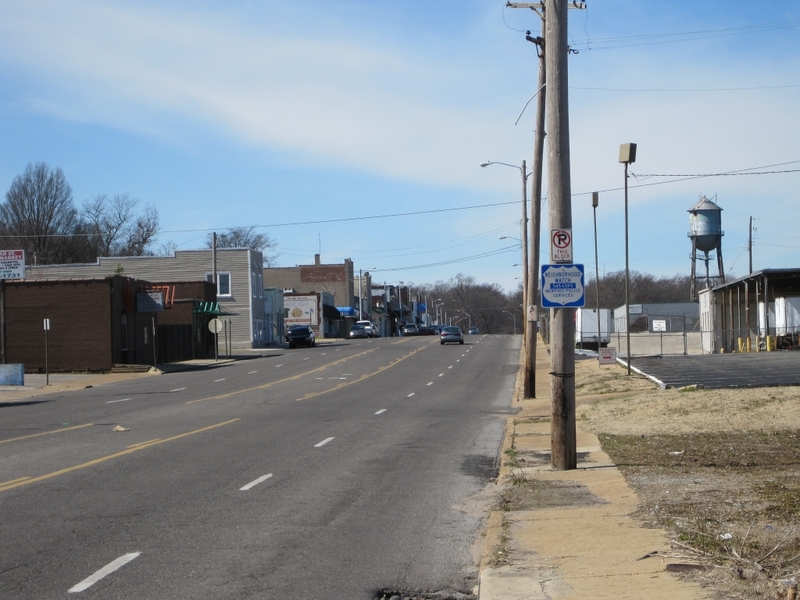 The neighborhoods surrounding Treadwell schools are today affectionately referred to as ‘the Heights’. (Most end with this word in their name: Highland Heights, Mitchell Heights, Brinkley Heights, etc.). The conflation of these diverse neighborhoods into one symbolic reference, the Heights, springs from a growing collective passion and neighbors’ active work to be a unified community. 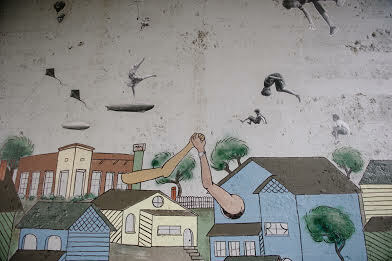 Treadwell is at the center of most great stories that are told about this community. Assembling and collecting these great memories from the past are vital to the new and vibrant future emerging for this special collection of united neighborhoods. Way-finding signage is sparse in the region and can be very expensive to erect. A smart phone application that is free for download and allows users out on the trails to make connections between local assets is a more cost-effective option. Current statistics indicate that there is a significant market for smart phone applications in the Mid-South. Regional studies have determined that local smart phone ownership is higher than the national average and is on the rise. Based on a 2012 Obsidian PR and Research Dynamics poll, 66% of Shelby County residents own a smart phone, up 6% from the previous year, and surpassing the Pew research Center’s national ownership rate of 56%. Tara Wohlgemuth and the Mid-South Greenways team are helping pedestrians and cyclists navigate Memphis’ many parks and trails more easily. In 2011, Mid-South Greenways digitally mapped the region’s growing number of greenways in a format optimized for desktop viewing. Mid-South Greenways and their partners at Hieroglyph Creative Co. are now developing a smartphone for seamless navigation of the region’s parks and trails. With this app, cyclists and pedestrians can pull out their smart phone and access information regarding the parks, trails, and destinations that are closest to them. This will include routes and distances to travel safely compelling to user to continue his experience. Users will become more familiar with existing green infrastructure and will also be able to determine where the missing connections should be made. With the knowledge in their pockets of where these existing facilities are, they will be more likely to frequent them. The app has the potential to significantly improve access and use of existing parks and greenways, thereby influencing general public health, rates of active transportation, and the environmental impact of the build environment. Located in Frayser, a low-income neighborhood, the Whitney Elementary School community faces a multitude of challenges. Being classified as a “failed school,” Whitney was taken over by the state of Tennessee in an effort to raise student achievement and overall performance. The staff has an overwhelming desire to make their school and community cleaner and greener. The purpose of this project is to provide the school with someone on site to coordinate a move towards sustainability in a concrete manner. Clean Memphis has worked closely with Whitney Elementary in the past and the interest is present, but the manpower is not. This project seeks to change that. Janet Boscarino and the team at Clean Memphis are raising money on ioby’s crowd-resourcing platform to hire an environmental coordinator at Whitney Elementary School in Frayser. Working closely with the Clean Memphis education team and the school community, this intern will employ a bottom-up approach to sustainability that is designed to meet the unique challenges faced by the students, families, faculty, and staff at Whitney Elementary. The bulk of the work for this project can be broken down into two categories: implementing sustainability practices for the school community and providing environmental education across grades and content areas. In being present at the school on a bi-weekly basis, this environmental coordinator will be able to establish and monitor student “green teams” that will gather the contents of recycling bins from classrooms and weigh and document it. Led by Chris Peterson, GrowMemphis is using ioby’s crowd-resourcing platform to fund tools and training for neighborhood residents who want to create and sustain community gardens or urban farms in their neighborhoods. As part of its annual process, GrowMemphis is soliciting applications from neighborhood residents and institutions, prioritizing them based on need and community leadership, and offering selected groups all of the tools, supplies, and infrastructure they need to get started. After receiving this initial support, each new partner garden goes through GrowMemphis’s “Community Gardening 101” training, which helps new gardeners feel comfortable with organic horticulture. More importantly, this training prepares gardeners to do the community work that makes a community garden successful. Community gardening projects address a variety of community issues in creative ways, and the impact of each garden is unique to the neighborhood in which it is found. These projects not only eliminate vacant, blighted property and provide healthy, fresh food to neighborhood residents, but they also build community pride and create a safe space for community building. As neighborhoods engage in these projects, it is the hope of Clean Memphis that the gardens become a tool for broader community engagement around issues of environmental injustice, food insecurity, crime, and poverty. Clean Memphis knows that community gardens cannot fully solve these problems, but they can serve as the catalyst for residents to take back ownership of their communities. Carnes Elementary School, a magnet school whose curriculum is focused on Environmental Science, sits in a neighborhood that is devoid of greenery. Without access to safe, vibrant open spaces, children in the neighborhood have trouble understanding what they hear and read about in their environmental science classes. Memphians Mary Baker, Steve Barlow, Beth Flanagan, Janet Boscarino, and Ray Brown are leading a campaign to transform a vacant lot across the street from Carnes Elementary School into a beautiful garden and outdoor classroom. The team believes that this garden will provide the neighborhood with much-needed vibrant, open space and supplement the school’s environmental science instruction. The lot, located at 916 J.W. Williams, is only 40 feet wide and 92 feet deep and the soil is hard packed and dry from many years of neglect. The demolition and disposal of a dilapidated home left a large depression in the center of the lot, and damaged the surrounding terrain. Its uneven surface is studded with half-buried pieces of brick and concrete. The team, which includes an architect, a planner, and an attorney, plan to convert this lot into a tiny, balanced ecosystem where the students can observe the relationships between plants, insects, birds, and other animals in a natural environment. We believe that the children of Carnes Elementary will love learning about the environment in this garden. The team would like to begin by February 15, 2014 and complete the garden by June 15th. This schedule will permit them to repair and restore the damaged terrain, build the walks and fence, plant native trees, build raised and other planting beds. The mission of the Klondike Smokey City CDC is to improve the economic health of the North Memphis Community through community, workforce and family development programs. The median household income in the neighborhood is $18,357, which is less than half of the Memphis media and about one third of the Shelby County median. About 43% of Klondike Smokey City households are living in poverty. The Klondike Smokey City CDC is using ioby’s crowd-resourcing platform to raise funds to provide Klondike and Smokey City with extended learning opportunities and to maintain their current level of services. Specifically, the CDC will offer classes in community gardening, computer literacy, financial literacy, and healthy lifestyles. The CDC’s goals are to catalyze revitalization and economic growth to North Memphis, to help neighbors establish and maintain a high quality of life, and to help restore the historical status of the Klondike and Smokey City communities. The Vollintine Evergreen Community Association (VECA) has an after school program to serve the youth in the neighborhood. The program focuses on mathematics, reading and social skills. The community challenges that the after school program addresses are two-fold. First, the program is designed for young people in the neighborhood so that they can have a place to go after school. The second problem is that the mathematics and reading achievement of the young people is below the state and national average. The Vollintine Evergreen Community Association (VECA) is raising funds on ioby’s crowd-resourcing platform to fund iPads for the neighborhood’s afterschool program. The purpose of this project is to provide a positive environment for children to go after school where they can enhance their education in a fun way. On an average day at the Vollintine Evergreen after school, the youth group has 15 attendees. VECA is asking for one iPad for each student at their current level of attendance. Memphis is on the cusp of building the most innovative bicycle infrastructure in the United States. 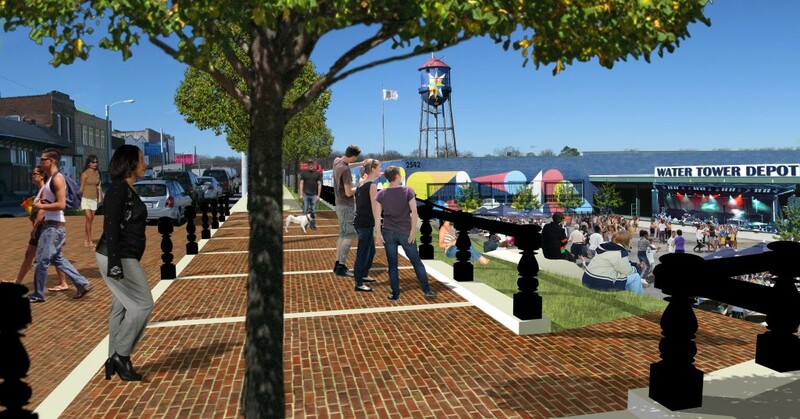 Broad Avenue Arts District and Livable Memphis launch public campaign to complete required funding. Memphis, Tennessee (October 14, 2013). Recognizing the growing interest for bicycling in Memphis, a public fundraising campaign has been launched to close the gap in funding required to provide a safe route for bicycle riders to go between Overton Park and Shelby Farms Greenline. 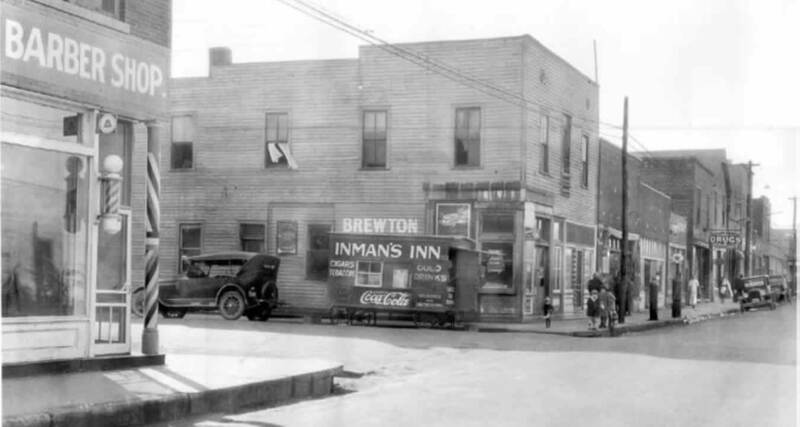 Coupled with the launch of the fundraising campaign is the announcement of the permanent name for the connector – “The Hampline.” The name was chosen to honor the nickname longer-term residents of the Binghampton community use when referencing their neighborhood. 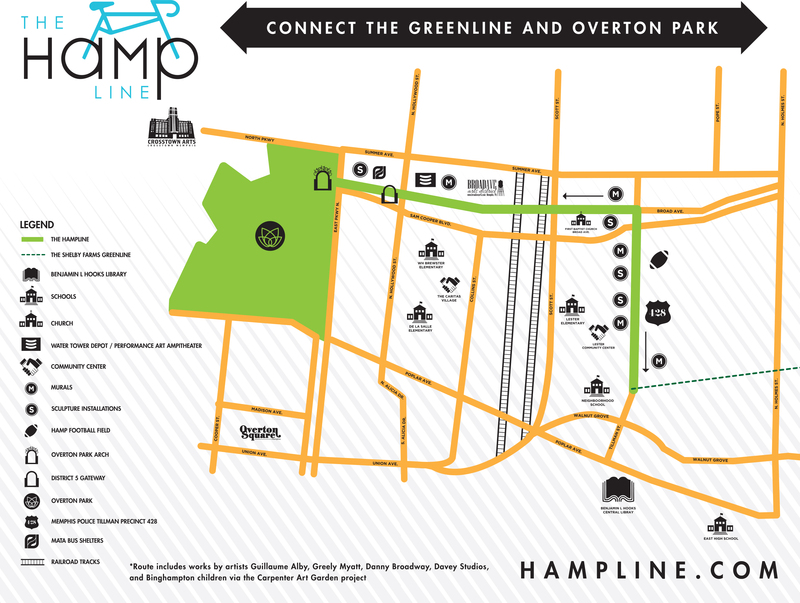 The Hampline is located in the center of the Binghampton community. Once completed, The Hampline will be the most innovative bicycle infrastructure project to occur within the United States. New York City has a few similar cycle tracks, as does Montreal and Vancouver, B.C., but The Hampline will be the gold standard for other cities to follow. The goal of the campaign is to raise $75,000 from the public. The remaining funds required to begin the build (approximately $175,000) will be raised via private contributions and foundations. The public campaign will utilize ioby, a crowd-resourcing platform for citizen-led neighborhood projects. ioby’s platform is similar to Kickstarter, but is specifically for grassroots-based civic projects. ioby fondly stands for “In Our Backyards.” Those interested in contributing to the campaign may visit https://ioby.org/project/hampline for more information. Any size donation is greatly appreciated. For the project to stay on schedule and the build to be completed, funding must be secured by November 23. Since ioby focuses on community-led, neighbor-funded projects, the planning team felt it was an ideal fit to close the funding gap. The project to create a bicycle connector linking Overton Park and the Greenline was launched in 2010 during Broad Avenue’s “New Face for an Old Broad” event. The event showcased the power of grassroots efforts to revitalize a neighborhood and the positive impact reconfiguring streets to support all methods of transportation can have in improving livability and neighborhood redevelopment. The Hampline is designed to be a cycle track designed for all levels of bicyclists. It will showcase best practices with regards to protected cycle tracks, considered best-in-class design for green lanes (protected bicycle lanes). This design provides greater safety for bike riders because it is physically separated from automobile traffic by a physical barrier. The project, which incorporates leading standards for on-road cycle track design, signalization, and storm water engineering, was designed and engineered by pioneers in the field (Fuss & O’Neill, Inc., Alta Planning and Design, and the GreenLane Project) in partnership with the City of Memphis Engineering. Livable Memphis and Broad Avenue Arts District provided project leadership. The total cost for the project is estimated at $4.5 million, which includes construction ($2.6m), planning and design ($600k), sidewalk accessibility improvements ($500k) and art enhancements ($800k). To date, over $1.2m has been raised privately via foundations and grants to fund the initial phases of the project. The City of Memphis secured funding for the majority of the build via Congestion Mitigation Grant Air Quality funding. In addition to showcasing engineering innovation with the street design, the Hampline will feature two miles of public art murals and sculptures, an amphitheater and numerous art galleries, this bicycle and walking track is located in the Binghampton Community (“The Hamp”) and links Overton Park and the Shelby Farms Greenline via a state of the art, two-way protected cycle track. ioby’s mission is to deepen civic engagement in cities by connecting individuals directly to community-led, neighbor-funded projects in their neighborhoods. Livable Memphis supports the development and redevelopment of healthy, vibrant and economically sustainable communities throughout Memphis. It is a coalition of active citizens, neighborhood organizations, educational institutions, non-profit and faith-based community groups, private and community developers, business partners, government officials, and departmental staff. 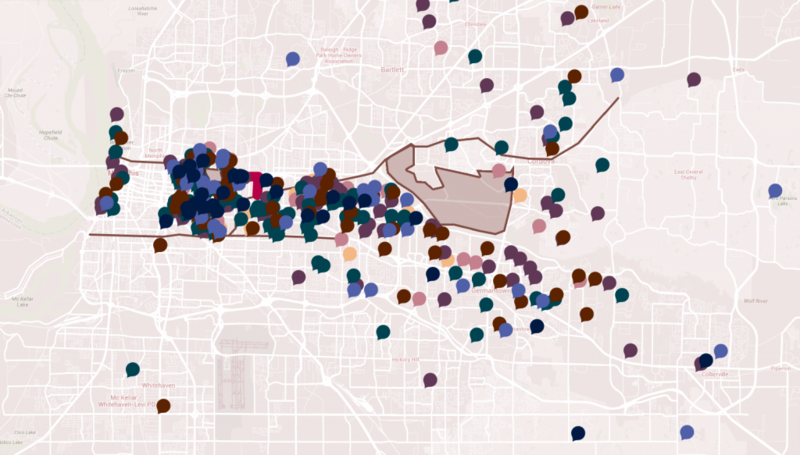 Representing over 125 neighborhoods in 32 zip codes, Livable Memphis provides a grassroots voice for communities in the ongoing community conversation about development trends and challenges to neighborhood revitalization.